This weeks WordPress Weekly Photo Challenge is about things that catch your eye, and how you feel, you must stop what your doing, and take a pic. Whenever I see anything at all unusual, I most definitely get that “Ooh, shiny!! !” feeling, such as this flintlock pistol wall display, in the entrance hall of Culzean Castle, on the west coast of Scotland. Now, as I said to Lorna (Lorna’s Blog), in my previous Culzean Castle post, I’m not usually a fan of anything connected with guns, but this display was just so unusual!! 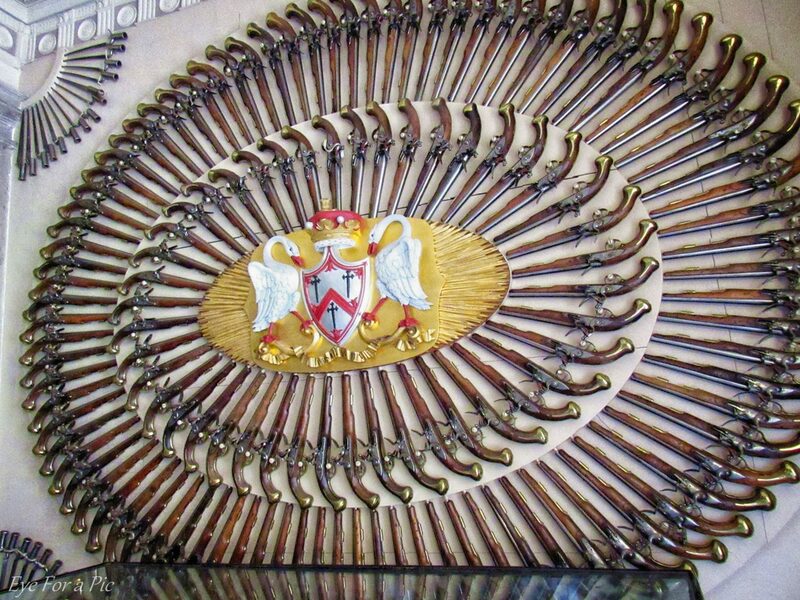 This is just one of three walls worth of flintlock pistols and musket rifles, which if I remember correctly, were all used during the Napoleonic Wars in Europe in the early 1800s. Thanks Lucy, it is an amazing sight, my photo doesn’t do the room justice! The photo of Culzean Castle is stunning. I loved the way you captured it through the entrance. The pistol display is interesting, but as usual, many of your photos draw me to visit. Just stunning. What is it about castles! Just beautiful!!! I haven’t heard of, or seen, this display before. Thanks for sharing your fantastic photo of it with us. It’s an amazing sight Allan, worth a visit just to see the entrance hall!!! Thanks Lorna!!! Lol!!!! I hadn’t considered the dusting, it must be an absolute nightmare! The thought of it just fills me with dispair! Lol! I bet the 12th Earl of Cassilis, who I think collected them, never had to do any of the cleaning of them! And it certainly is fascinating to wonder what has happened at various castles at different times – in this particular case, the castle was never used as a fortification, it was much more of a manor house rather than a castle! But the top floor was gifted to General/President Eisenhower, for his involvement in the Second World War, and he stayed there 4 times, one time as the President of the USA. You’re welcome 🙂 Yes, that’s true! Some places have gone through very rough times whereas others just have been used for prestige reasons or to show off. Very cool photo! I would love to travel to Scotland. Thank you Po’Girl 🙂 I’d certainly recommend Scotland to anyone, it’s an amazing country!